I relish reading novels that share a setting with those in my books, and make note of the similarities and differences. Such joy is not shared by all authors. Needless to say, I've since been shy about asking authors for blurbs or reviews. Besides, as a reader, I've read too many glowing author blurbs attached to horribly written books and often asked myself and other authors, "Did we read the same book?" Of course, positive comments are understandable - turning down a colleague is not easy, and skilled writers can unearth some redeeming quality for a review - but excessive, hyperbolic praise draws red flags. Readers doubt their own judgments, and some eventually give up on an entire genre - mysteries in particular. Such experiences have likely contributed in some small way to making me more open to exploring new settings. The latest is Afghanistan. And I do not mind reading or commenting on books that share the setting. 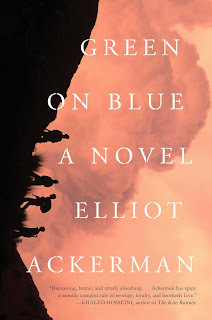 That said, I just finished Green on Blue by Elliot Ackerman. 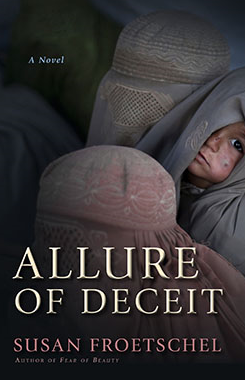 Like most books set in Afghanistan, the novel is more violent than Fear of Beauty or Allure of Deceit. Still, the novel is beautiful, lyrical, and I recommend it highly to readers who have enjoyed my books. The similarities are rich and rewarding. While reading the novel's early pages, I felt at home. Aziz's parents would get along with Parsaa and Sofi. Parsaa and Mumtaz would respect each other. Aziz and Saddiq could well be friends. Aziz is probably a bit older than Saddiq but both are restless, thoughtful, and resourceful, especially outdoors, whether climbing mountainsides or trees. Both fall in love, and both have older brothers named Ali. 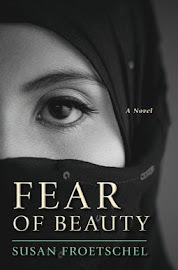 Saddiq's brother is murdered, and Aziz's is the victim of a bombing at a marketplace. As with any young Afghan, Saddiq and Aziz must cope with constant uncertainty, never sure what the next day or moment might bring. Each must engage in constant calculation and deceit to survive and to help others of their choosing to survive. The books share so much in terms of atmosphere, tone, characterization, themes, philosophical exchanges and even pet birds - a magpie in Blue on Green and the mynah in Allure of Deceit. The characters in these books think alike. Notably, Mortaza in Ackerman's book, like Parsaa in Allure, rejects charity: "Those boys need an example of strength. The promise of charity has paralyzed them." Yet the plots could not be more different. Saddiq, keenly aware of individual motivation and need, has less reason to seek revenge. After losing his family, Aziz becomes a soldier, a murderer, a terrorist. He finds revenge, but that's not enough to renew the bonds with his brother. But no, Aziz is alone and Saddiq is not. Saddiq's life is more orderly, more comfortable, not peppered with treacherous humiliations. He's not forced into settling life-and-death moral quandaries with every encounter. The two young men are trustworthy, but for only a select few. Each can easily lie to family or the closest friends. Aziz lies to escape his many losses and perhaps in an inept way, to reduce mental anguish for his brother. Saddiq's deceit is in pursuit of his own version of justice. It's no wonder that Parsaa, leader of Laashekoh, does everything in his power to avoid foreign or Afghan fighters. As Ackerman suggests, the small lives we build can unravel at any moment.